I’m in love with turmeric at the moment! Not just in the ‘turmeric/golden lattes’ many people are drinking these days, but in so many savoury dishes. Like everything and anything I can sprinkle or freshly grate it into. Next time you cook scrambled eggs, try adding a teaspoon of ground turmeric, a pinch of chili flakes and some baby spinach. Then add a little feta or cashew cheese at the end. Seriously SO good! 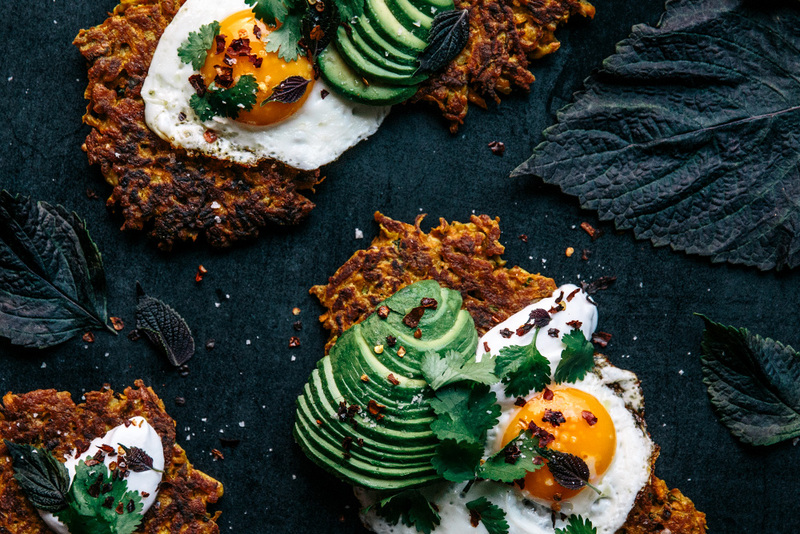 My new love for turmeric is what inspired this week’s new recipe; Turmeric Spiced Carrot & Halloumi Fritters with Coriander, Fried Eggs & Avocado. These fritters are super tasty, and the kiddos will love them too as they’re lightly spiced and a little sweet due to the carrot. I've served the fritters with fried eggs, sliced avocado, coconut yoghurt and fresh herbs, but feel free to change it up as you like. Maybe just avocado, or more of an avocado smash with fresh herbs and lime, or maybe scrambled eggs with some wilted spinach. Whatever you decide, they’ll make a delicious breakfast, lunch or even light dinner. They will also freeze well for quick and easy ready prepared meals. Just add the trimmings and you’re all set. In a large mixing bowl, combine the grated carrot and halloumi with the eggs, buckwheat flour, spices, fresh ginger and coriander stalks, mixing together until well combined. Put a frying pan onto medium heat. Once the pan is hot add a tsp ghee to the pan. Once the ghee is melted, add scoops of the carrot and halloumi mixture to the pan, forming three fritters roughly 2-3 tbs each in size. Spread the scoops out in the pan with a fork so they become a little flatter. I like to use a fork to ‘fluff’ the mixture as I spread it, rather than using a spatula or spoon to flatten it. This helps to keep the fritters light and not stodgy. Cook until golden brown on each side (a couple of minutes cooking time on each side). Remove the fritters from the pan and repeat with the remaining mixture. Serve the fritters with a fried or poached egg, some sliced avocado, a dollop of coconut or natural yoghurt, and sprinkle with chili flakes, coriander leaves and sea salt. Enjoy!